I think poetry is far more open to interpretation than standard fiction, and is therefore more subjective. I find reviewing it a challenge, but one that I enjoy. I often shy away from poetry that isn’t straight forward in its delivery or style. I love poetry that is pleasing to the ear when read aloud, poetry that is not difficult to understand. If I can’t glean meaning directly from the words, then I should at least feel something, and I’d rather it not be a headache. While reading Wright’s collection, I sometimes felt I was missing a deeper meaning that he intended. It was as though the lyrical language he’d employed, rather than reveal the truth, hid it within its own beauty. The title poem, in two parts, is like an out-of-body experience or a drug-induced hallucination. There is a looking down from above, a realisation of the vastness of the world around you and your insignificance within that vastness. This appears to be a recurring theme throughout the collection. There is a sense of enlightenment about this poem, something that can’t be explained to those outside of it – an epiphany of sorts. ‘Catch’ – This poem captures the very essence of what writers do. We imagine. We hypothesise. We make up stories about other people’s lives, but why the draw of the sad story – the tragedy? Why do our minds go there so readily? It’s as though we’re preconditioned to sadness, and the thought that people could truly be happy is more a myth, a fairy-tale we’re not prepared to believe. This is what life does to many of us. It takes our innocence and our optimism as we grow. Our experiences often lead us into habits of negative thought and belief. ‘Afternoon Reading’ – I liked the following stanza in particular. how to make an end. To me this was symbolic of life. We begin innocently with no thought of how it ends or the journey we’ll take to get there, but this is a good thing; if we knew, we might give up. It also symbolises writing, poetry more than fiction. I feel this sense of luxury when I sit to write poetry. I like to just let the words and images come and take me where they will. It is fluid. It is freedom. It is all things and nothing. Many of Wright’s poems explore the divide between childhood and adulthood. Any adult knows that the journey between the two is a metamorphosis that is often painful. How could it not be? We are ripped from innocent play and our enjoyment of the world around us without thought for our place within it, to awareness, enlightenment of just how small and insignificant we are, of how little we matter. And yet, as children, we often rush towards this freedom, this escape from the restrictions placed on us by protective parents. Wright highlights the gulf between the young and the old, the difference in the memories each generation holds, their priorities, the things that matter most to them. There will always be misunderstandings and miscommunication, it seems, an inability to see things from the other’s perspective, to have empathy and show compassion for one another. Another theme seems to be the outgrowing of friendships and romantic relationships. It is sometimes the one least likely who changes and grows as a person and moves forward while the other stays stuck in a sometimes-regrettable life. This reflects what many people experience as a friendship changes and dies over time, when the people involved seem to move in opposite directions and become different from one another. Sometimes what draws people together in the first place ultimately drives them apart. Wright’s collection explores the themes of connection, disconnection, and reconnection. Of longing and love. Of different kinds of love, the changing of it over time, and the resisting of that change. How can you abandon it? The ones that can never be answered satisfactorily, and yet we go on asking them don’t we? Just as our writers, our poets, continue to do the same. Though there was a certain obscurity to some of the poems in Wright’s collection, I did enjoy it nonetheless. 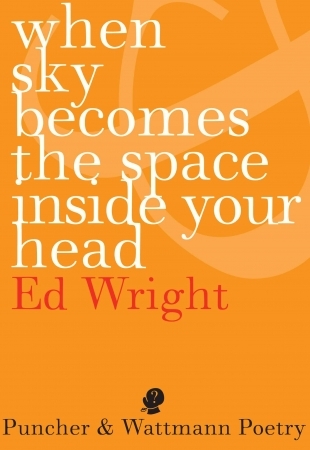 This entry was posted in Ed Wright, Issue 13, Lisa Wardle, When Sky Becomes the Space Inside Your Head and tagged Australian Literature, Australian poetry, poetry by Mark Roberts. Bookmark the permalink.